Optimized career sites designed to build a candidate pipeline & automatically keep members engaged with open positions. What Does Talent Network Do? With 3x the highest open rates and 5x the click through rate for job recommendations in the industry, our Talent Network engagement emails allow you to move beyond branding and into true candidate activation. If you’re looking to increase the efficiency of your recruiters and reduce the amount of time and labor it takes to keep your talent pipeline full, then it’s time to consider the full benefits of Talent Network. With 3x the highest open rates and 5x the click through rate for job recommendations in the industry, our Talent Networks allow you to move beyond branding and into true candidate activation. If you’re looking to increase the efficiency of your recruiters and reduce the amount of time and labor it takes to keep your talent pipeline full, then it’s time to consider the full benefits of CareerBuilder’s Talent Network. Talent Network allows you to build a talent community of your most relevant candidates, those who are interested in your company and ready to apply for the right position when it opens up. Nearly 85% of job seekers provide a resume when joining a Talent Network, meaning you can enroll them into automatic notifications about relevant positions as you post them. Talent Network allows you to build a pipeline of the most relevant candidates, those who are interested in your company and ready to apply for the right position when it opens up. Nearly 70% of job seekers provide a resume when joining a Talent Network, meaning you can enroll them into notifications about more relevant positions as they become available. Our mobile-first career sites are available in over 32 languages worldwide and have been built with over 20 years of proprietary candidate research to know how to build you a career site that converts. We know how to reduce the time to apply, how to ensure job seekers can find your site easily, and can apply easily with minimal steps on every device. On average, when Talent Network acts as a client’s career site, clients see 23% more applicants than through sites hosted by an ATS or agency. How Can Talent Network Help You? Drive candidates to search, join your talent community and apply for jobs on a career site built using 20 years of insider research, optimized for any device. Deliver new, relevant open positions to your talent network with automated emails powered by CareerBuilder's proprietary matching technology that receive 5x the industry click-through rate for job recommendations and average <1% on unsubscribe rates. Allow job seekers to join your talent network with Text to Join, then communicate to your members with two way text messaging via TextRecruit. 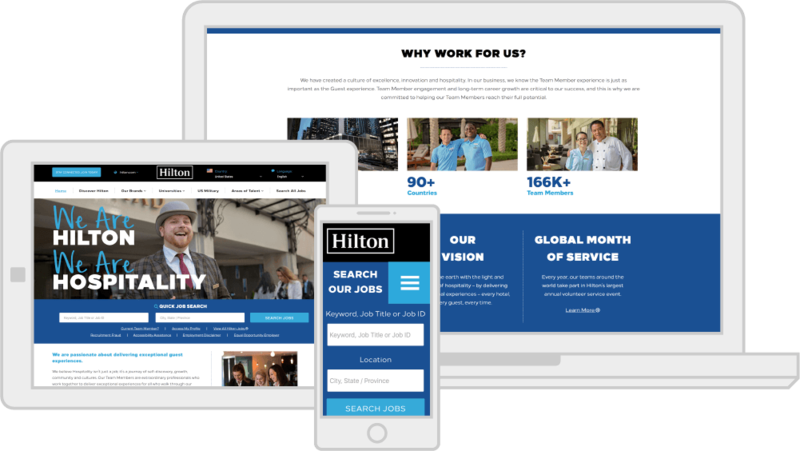 Showcase your unique employment brand with fully customized career sites that are proven to increase candidate applications, on any device. Understand candidate behavior and the power of your Talent Network's automated re-engagement, in an intuitive interface with actionable data. See it in action. Powering 4,000+ career sites in over 30 languages to deliver your message around the world. "For me, good customer service is a sign of a good company. And anytime we have to call the CareerBuilder customer support, it's like we are their only priority." Companies with direct apply receive 3x more applications through our job postings. One comprehensive sourcing platform with access to over 45 million resumes and over 125 million candidate profiles. Attract, monitor and manage your candidates with ease and build candidate pipelines with our applicant tracking system. Talent Network's analytics dashboard can give you a full overview of your account's activity with a clear funnel view of your site's engagement. Within the dashboard, you can also access your active jobs report to see the current postings you have open by category and locations. Traffic source is easily tracked by medium, device and source to help you understand where visitors are coming from and the devices they use to access your site. Within the members report, you can report back on growth and member activity to understand the health of your site. Additionally, you can track email performance with metrics on emails delivered, opened and with clicks. The Expressions of Interest report helps you identify overall applications, but allows you to drill into which locations have the most active candidates applying for your jobs. How many Talent Networks does CareerBuilder support? We support over 4,500 Talent Network and career sites for customers ranging in size from small to multi-national corporations. How many languages can Talent Network support? Talent Network current supports microsites and career sites available in over 30 languages including Chinese, Arabic, French, Spanish and others. Does Talent Network integrate with any other systems? Can I import my current database of candidates and automatically subscribe them to engagement emails? Yes, your past applicants can be entered into the Talent Network manually or via API. If you choose to import your applicant data, best practice is to email those applicants and invite them to opt in to your engagement emails to avoid any. Is my candidate data shared or accessible to other CareerBuilder customers? No, your candidate application data is stored in a unique database that is exclusively yours. At any time during your contract, you may choose to export your database via self-service or by contacting our customer support team. Can I see who unsubscribes to the automated emails? Client may access self-service options to view a variety of engagement metrics, including unsubscribes from the automated emails. Aside from emails, do you offer other candidate engagement services? Outside of our email program, we are happy to offer Text2Join, a feature that provides clients with a short code that can be advertised. Candidates can then text this code and be presented with a join form for your site. SMS Texting is also available through a third party partner that offers users the ability to text and communicate with candidates – tracking their conversations for compliance purposes.